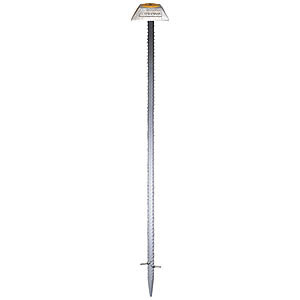 Manufactured from high tensile 18mm ribbed steel for maximum ground grip and rigidity. Three sizes available 350mm, 600mm and 1 metre to suit all ground conditions. Come complete with a unique reversible aluminium head allowing you to set the marker above ground increasing visibility or flush with the ground surface giving better stability and resistance to vandalism. Stainless steel spring retention lugs help prevent the all-important reference mark from being removed. When the spike is driven into the ground the retention lugs fold neatly up the side. Should anyone try and remove the marker the retention lugs are forced open with the soil thus resisting upward movement. Complete with a yellow data-disk allowing you to record the station reference numbers heights positions etc. Data can be recorded on the disk with the Tough-Mark site pen supplied. 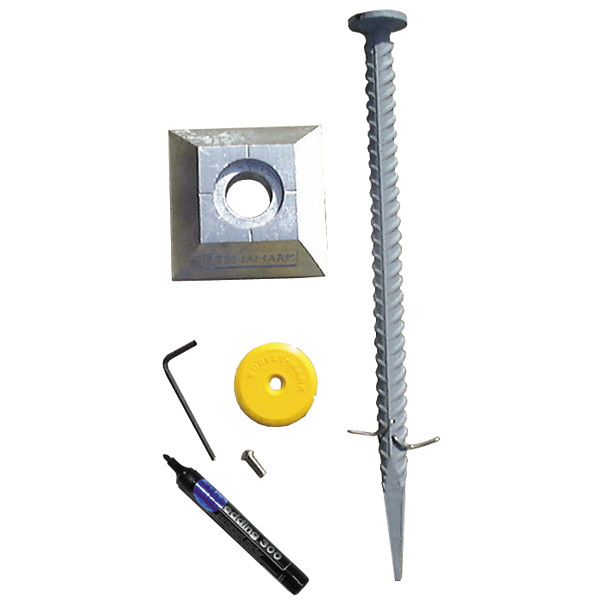 Perma-Marks have the data-disk secured to the top of the Perma-Mark head with a stainless steel dome headed stud which acts as the central plumbing point and high point for levelling work. A special adaptor is available which fixes to the top of the Perma-Mark which allows you to fix any standard 5/8" fitting accessory such as prism assemblies for monitoring work. Perma-Marks are simple to install: place the head in position and drive the spike through the head. Mark the data-disk with your details and secure with the plumbing stud. Every Perma-Mark comes complete with: Anchored spike - Reversible aluminium head - Yellow data - disk and stainless steel plumbing/levelling stud. Your consignment will also include an Allen key for securing the data-disk as well as a Tough-Mark pen for recording data.